6th APrIGF was successfully held on July 1-3, 2015 in Macao. 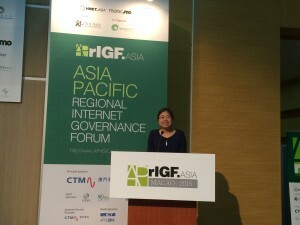 Asia Pacific Regional Internet Governance Forum (APrIGF) is one of the key regional initiatives on Internet governance which provides an open platform for multi-stakeholders to discuss and identify issues and priorities, and ultimately advances the development of Internet governance in the Asia Pacific region as well as bring forward and contribute to the wider global Internet community. APrIGF 2015 was hosted by Macau University of Science & Technology, Macao, HNET.Asia – the registry for the “.mo” ccTLD of Macau – and by the Macau High Technology Industry Chamber. It was in conjunction with an annual local telecommunications event, CommunicMacau Expo, from 3 to 5 July 2015. More than 300 participants from more than 20 Asia Pacific countries and economies joined the event. An IIPL’s fellow was selected to join the Youth IGF concurrent with the main session. Prof. Xue gave a keynote speech on the plenary “Manila Principles on Intermediary Liability” on July 3 and analyzed the new Chinese legal initiatives (such as Draft Cyber Security Law, revised Criminal Law and Consumer Protection Law) in the lens of the Principles. The speech was warmly welcomed by the audience at APrIGF. During the event, the delegate of Beijing Normal University Law School, led by the Dean Prof. Zhao Bingzhi, paid the official visit to the Law School of Macau University and discussed with MU Law Dean Prof. Mo Shijian and Associate Dean Prof. Augusto Teixeira GARCIA regarding the collaboration of two schools, particularly enabling BNU students in Hande School Portuguese Program to access the exchange and even Master degree opportunity in Macau. The Dean of BNU Law School, Prof. Zhao, also discussed with Macau Prosecution Officials regarding BNU students’ possible internship in Macau judiciary.